The Sodders never rebuilt the house, instead converting the site into a memorial garden to their lost children. 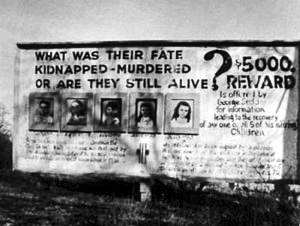 In the 1950s, as they came to doubt that the children had perished, they put up a billboard at the site along State Route 16 with pictures of the five, offering a reward for information that would bring closure to the case. It remained up until shortly after Jennie Sodder's death in the late 1980s. In support of their belief that the children survived, the Sodders have pointed to a number of unusual circumstances before and during the fire. George disputed the fire department's finding that the blaze was electrical in origin, noting that he had recently had the house rewired and inspected. He and his wife suspected arson, leading to theories that the children had been taken by the Sicilian Mafia, perhaps in retaliation for George's outspoken criticism of Benito Mussolini and the Fascist government of his native Italy. State and federal efforts to investigate the case further in the early 1950s yielded no new information. The family did, however, later receive what may have been a picture of one of the boys as an adult during the 1960s. Their one surviving daughter, along with their grandchildren, have continued to publicize the case in the 21st century in the media and online. UNPLEASANT FACT: Your brain can play tricks on you to make you see monsters in the mirror, called the Troxler Effect. December 1924, two crew members of the S.S. Watertown James Courtney and Michael Meehan were killed by the gas fumes while cleaning the cargo tank of the ship. They were buried at sea. To everyone’s horror, the faces of the two soldiers appeared in the water the next day. They were so distinct that the captain ordered to take pictures of the apparition. Experts examined the photographs and the negatives, but there were no signs of them being tampered with. We had a baby monitor that, besides sound, also monitored the baby's breathing and set off an alarm (SIDS). The alarm would go off on the baby's side to jar them, and also the parents remote. One night we forget to turn up the sound and in the middle of the night I roll over and see the lights pegged. I freaking fly out of bed screaming to my wife. Darting into the nursery I suddenly find NO BABY IN THE CRIB. I suddenly realize my wife must have brought the little guy to our bed and forgot to turn off the alarm. I wheel around and pass her coming in and say, "He's in our bed" and she screams bloody murder because this, she knows for a fact, is not the case. My whole world just stopped with absolute abject terror. She screams "WHO TOOK MY BABY?!?" Somehow, through massive adrenaline rush and massive fright, I Sherlock Holmes it: house alarm is still armed, no windows or doors could have been opened; the nursery door was closed. He must still be in the room. Glance around and see the only place he possibly could be is behind/under the crib. I fall to my hands and knees and low and behold little dude is on his belly looking at me, smiling (even thought mom is hysterical). I reach under and gently pull him out by his ankles and mom meanwhile sees this and assumes he's not alive- because HOW THE HELL DOES A ONE YEAR OLD climb out of a high sided crib when he can't even stand, AND manage a four foot fall unharmed?!? She scooped him up and cried for an hour rocking him. I didn't sleep that night- little monster has had us guessing ever since.